Apple's latest iOS 5 operating system for iPhone, iPad and iPod touch devices went live last week and one of its new features is custom notification tones. Apple's software previously enabled custom ringtones, but not custom notification tones. iOS 5 users can now set custom notification tones for SMS, e-mail, voicemail, Twitter, calendar and reminder sounds. Officially, Apple wants you to buy these tones: a "buy more tones" link is embedded into the sound settings, directing you to a customised alert tone store that sells ringtones for $2.19 and alert tones for $1.19. However, just like custom ringtones, users of iOS 5 can also create custom notification tones, too. Here's how. 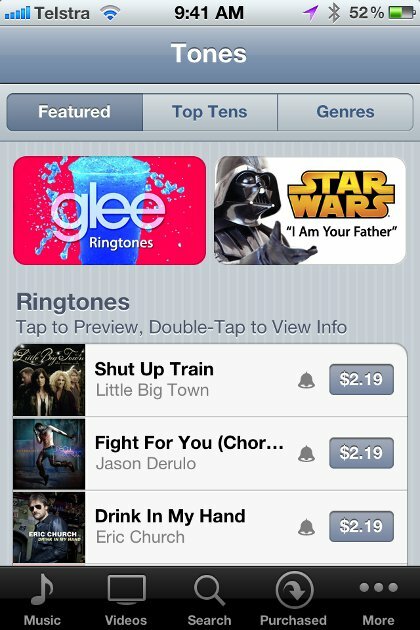 Apple's "Tones" Store: Ringtones are priced at $2.19 and alert tones cost $1.19. 1. Open iTunes and select the track you want to convert to a notification tone. A good resource for free message tones and sound effects is Zedge. 2. Right-click on the track and click "Get info". This will open the properties page for that particular track. 3. Click on the "Options" tab. Check the "Start time" and "End time" boxes and enter the portion of the track you want to create as a ringtone. Keep in mind the length of the tone needs to be 30 seconds or less, otherwise it will not play. For notification tones, we recommend no more than five seconds, unless you want to hear a 30 second sound each time you get a message or e-mail. Press OK once you're done to close the properties page. 4. Right-click on the track again and click "Create AAC version". iTunes will create a second version of the track you edited. 5. For Mac users: Right-click on the new track and click "Show in finder". For Windows users: Right-click on the new track and click "Show in Windows Explorer". 6. Once Finder (Mac) or Windows Explorer (Windows) opens, rename the file extension you created from .m4a to .m4r. This is the file standard Apple uses for ringtones and notification tones. 7. Go back into iTunes. Select the file you created, right-click on it and select "Delete". Click "Remove" to confirm and when prompted click "Keep file". This will remove the track from iTunes, but keep the actual file you created. 8. Go back to Finder (Mac) or Windows Explorer (Windows) and double-click the .m4r track you created. This will add it to iTunes as a ringtone. 9. Sync your iPhone through iTunes and the tone will appear in the sounds menu on your iPhone. That's it! 2. Click Edit in the menu bar and then click "Preferences". 3. Scroll down to where it says "When you insert a CD" and click "Import Settings" on the right. 4. Click the drop down box next to where it says "Import using" and select "AAC Encoder". Click OK.
Now when you right-click on a track in your music library you should get the "Create AAC version". Apple has also introduced custom vibration patterns in iOS 5. To turn these on go to the settings menu on your iPhone, tap "General" then "Accessibility. Scroll down to "Custom vibrations" and turn this on. Apple's custom vibration settings in iOS 5. Once you've turned them on, go back to the sounds menu in settings. 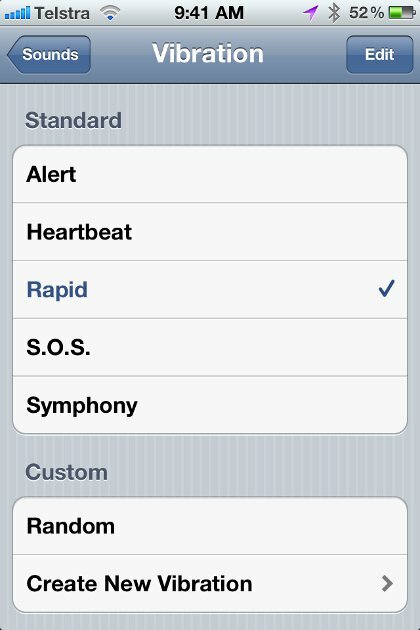 Scroll down to "Vibration" and you can select from five presets: alert, heartbeat, rapid, S.O.S and symphony. You can also create a new vibration pattern in the menu below by tapping on the screen.